This class picks up where Level 5 left off. We will begin with another great query example. This time we'll use the Is Not Null keyword see how to find customers that have ALL of their address info (street address, city, state, and ZIP code) so we don't print mailing labels for customers that are missing info. Then we'll generate a report for our secretary to call any customers who are missing data in ANY of their address fields. We'll use the Is Null keyword and the OR rows. Next we'll build an Employee table. We'll see how to save some time by copying similar fields from the Customer table. We'll see the input mask for a Social Security Number. We'll learn how to store pictures in our database using an OLE Object. And, you'll learn how to edit a hyperlink. Once the Employee table is built, we'll construct an Employee Form. Again, we'll learn how to recycle some of the similar fields from our Customer form. You'll learn about CTRL-A to select all fields. We'll learn more about the form design grid and the Align to Grid and Size to Grid features. We'll see how the Format Painter works, and how to resize a group of fields together. Next you'll learn how to insert pictures into our employee records using a Bound Object Control. Since JPG and GIF images don't always display in Access, I'll show you how to use Microsoft Paint to convert your pictures to BMP files which will display on your forms and reports. We'll learn about the Stretch, Zoom, and Clip properties of images. Finally, we'll create Employee Name Badges. This will be a report showing all of the employees in the database, their name, title, picture, and a company logo. The latter will be added using an Image Control, and we'll talk about the difference between bound and unbound images. 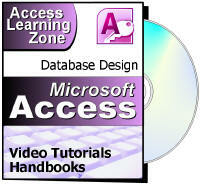 Richard on 8/8/2012: This Microsoft Access video tutorial picks up where Level 5 left off. This class covers finding customers with missing address info, creating an employee form with a picture, creating employee name badges, and more. Topics include: - Missing Address Info - Is Null and Is Not Null Scenarios - OLE Objects - Storing Pictures in a Database - Align / Size to Grid - Stretch, Clip, Zoom Images - Employee Name Badges - Adding a Company Logo - Bound v. Unbound Image Controls Click here for more information on Access 2010 Beginner Level 6, including a course outline, sample videos, and more. Brent on 8/9/2012: Level Seven is in production after Search Seminar right? you said you were going to jump right over to the search seminar after level 6. Karen on 8/20/2012: I'm creating an order form that has a Customer, a Pickup and a delivery contact. Sometimes my customer is also the pickup or delivery, sometimes its three different contacts. How do I set up my order form to pull information for all three contacts. Understanding relationships between tables do I need to set up a master "Contact" table and then seperate "Customer", "Pickup" and "Delivery" tables or can I pull from just the "Contact table"? Ideally, you would want 2 different tables here. One for your "contact" as you call it, and then a second table to store the related information (customer, pickup, delivery). This is a classic one-to-many relationship. I have NOT covered this yet as of Access Beginner Level 6. I will be covering it in Access Expert Level 1. If you want to learn it now, you can see Access 201 (for 2003) or my Access Relationship Seminar. Tom Cermak on 9/21/2012: I used paint, changed the picture to a bitmap, but it still displays as an icon. Make sure you don't have the "display as" set to ICON. Beyond that, I'm not sure... I've never encountered an Access database that couldn't display a bitmap. Tom Cermak on 9/21/2012: Display type is set to "Content" still the same. I tried inserting it (as opposed to the drag and drop) no luck there either. I'd have to see your database to tell you for sure. I've never known Access 2010 to do that. Older versions were horrible with displaying images, but 2010 has always worked great. Wanda W on 11/28/2012: I'm trying to insert a picture in my form, it's an inventory list form, and I converted the file to Bitmap and I get this error message when I drag the bitmap file over: "Microsoft Access can't read the OLE object because communication was interrupted. If the OLE server application is located on a network server, make sure your computer is connected to it". It is on a network server and it is connected, I have confirmed this. The original picture was a 2.3 Mb jpeg and when I converted to a bitmap it became a 20.5 Mb file. Would the larger file size be an issue? I know we have limitations on our server with emailing files larger than 10Mb, but this is not email. Would the file size be the issue? Can I convert the bitmap file to a smaller size? I would guess that the error is caused by the size of your file. Yes, that's pretty big. First, try the JPG directly. It might work. JPG and GIF files work OK on some systems, they just don't work reliably on ALL systems. Second, you might want to consider a different technique for displaying your images. I have a whole seminar on ACCESS IMAGING. Basically, storing images in your database works OK for small files, and when you don't have a lot of them, but for BIG files (or lots of files) the best solution is to just store the image on your network (or PC) drive and save the path/filename in your database. I cover several different methods for doing this in the seminar, and there's also a TIP VIDEO that explains a good technique too. Oh, and yes, it's sometimes possible to shrink the size of a bitmap. Get it on your screen and perform a screen capture of it (press PRINTSCREEN, paste into PAINT). You'll lose some resolution if it's a HUGE file, but that's usually good enough. Vannak Hou on 12/9/2012: If you were to put "Is Null" on the same line in the "or" right across in each field, does it affect anything? You put "Is Null" in each of a different place under the "OR" section. It's like a step ladder. Are you suggesting that is a good way of writing a code/program? Index Time: 12:40-12:50. If you go straight across one row, you're making an AND condition. So FirstName Is Null AND LastName Is Null AND CompanyName Is Null. If you go DOWN one "OR" row each column, then it becomes an OR condition. So you get FirstName Is Null OR LastName Is Null OR CompanyName Is Null. Eli Tilahun on 12/11/2012: I used paint, changed the picture to a bitmap. It displays on the Form, however it doesn't display on the report (label). It should. As long as you're using the same control type, and it's still bound to the same field, and that field is in your report, it should work. Make sure the field that stores the picture is in the underlying record source for the report. You should just be able to copy and paste that picture control from the form directly to the report. Also, make sure you're in PRINT PREVIEW mode. Pictures don't generally show up in the default "report" view. Eli T on 12/14/2012: I can copy the picture from the Form and paste it to the Report, but it doesn't show up automatically. I've done it a million times in my databases, but I'd have to see a copy of your database to tell you why it's not working for you. JPGs and GIFs can sometimes be a pain with Access, but BMPs always work. Ron, make sure that you have Microsoft Paint set up as the DEFAULT HANDLER for BMP images. This is a Windows setting. You want to make Paint the application that opens BMP images by default. You can do this by right-clicking on any BMP file, selecting OPEN WITH, and then selecting Paint. Make sure to set this as the DEFAULT app (open with this app every time). The steps are roughly the same, but slightly different with each version of Windows. You may have some other application install that's trying to "handle" BMP files which is causing problems in Access. You can also TRY to do the same thing with GIF and JPG images. Ron F on 12/17/2012: Richard, did what you said and still not successful. Talked to the IT Department here and they think it could be a problem with the Network. They will look into it. Just as long as I know HOW it should be done and not that I or you are doing something wrong. Thanks for your help! "MS Access can't read the OLE object because communication was interrupted. If the OLE server application is located on a network server, make sure your server is connected to it." Not sure what that means; my home computer is connected to a WiFi router and network. I also tried the other route: right click in the box --> new Access menu --> create from file --> browse, etc. But I got the same message. As I mentioned in the lessons, Access itself doesn't handle images. It relies on whatever your computer's default application is for that image type. You can determine what this is by double-clicking on an image file from Windows Explorer (or My Computer) and whatever app opens up the image is your default handler. Any time Access gives you that error message, it's having a hard time communicating with the handler app. You can try CHANGING that app by right-clicking on the image file and selecting OPEN WITH... Pick another program like Microsoft Paint or MS Photo Viewer. Sometimes other 3rd-party apps like Photoshop or even your web design editor can "take over" handling of JPGs and Bitmaps, which is bad. Mike Rand on 3/31/2013: Me too. I'm having a similar problem. Both *.jpg and *.bmp pictures render properly on my desktop but when I drag them to the picture field they appear as only an icon. 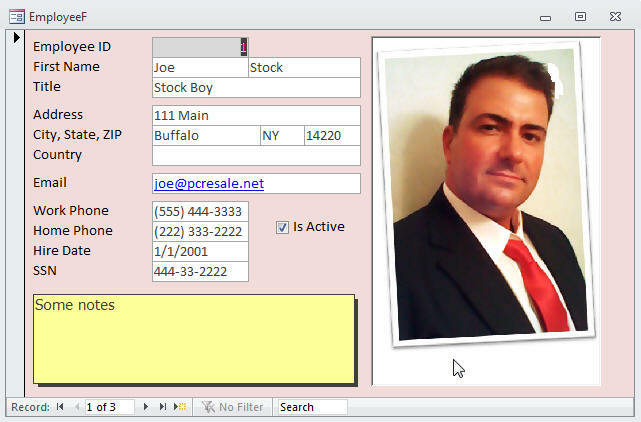 I can send you a "Prnt Scrn" or my PCResale Customer Database file, oi that would be helpfull. Mike Rand on 3/31/2013: Where di I find the "Display as Icon" setting? Patricia Clark on 4/23/2013: Is Format Painter available in Access 2007? I can't find it. Yep. It's been in there since at least Access 2000. I don't have 2007 installed anymore so I can't tell you exactly where it is, but in 2013 it's on the Form Design Tools > Format tab. Mo Khan on 5/3/2013: How did you select all the fields from the field list? Its been bugging me all day. Click on the first one. Hold down the SHIFT key. Click on the last one. Martie Jacobs on 6/4/2013: Beginner 6 Lesson 3: As I followed along in creating EmployeeF, I realised that I mistakenly created a report. So I copied and pasted the design from EmployeeR into EmployeeF but now the EmployeeF does not have a table source. How would I select the source at this stage? 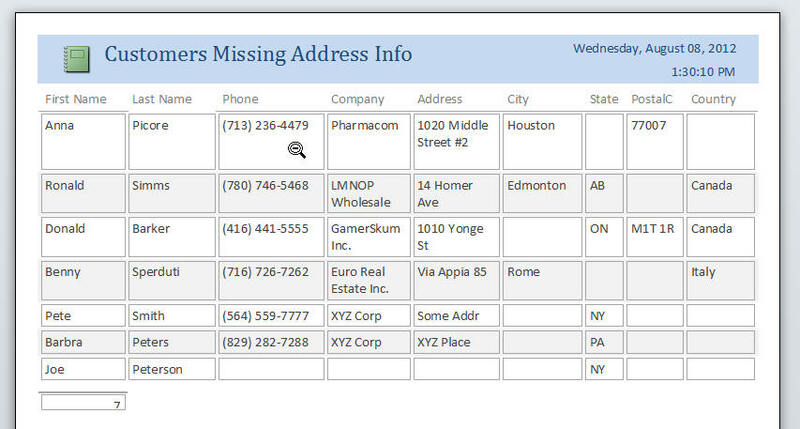 Open up the form properties and change the RecordSource to your table. Tracy Wilson on 6/19/2013: Hi Rick, Lets say I want to sort Ranks (they are not alphabetical but have a hierarchy of their own). I added a number to the front of them in the drop down list so I could sort them by number, but how do I DISPLAY them in the report WITHOUT the number being visible? Use three fields. Have an ID, a SortOrder, and the RankName. In a query, you could create a concatenated field for your display value in the combo box but still only show the RankName in your report. I have "Notes field" with the caption "Notes". When I view it in Form view the word "Notes" does not display. What am I doing wrong? I assume that's your LABEL that's not displaying? Have you tried to move it? Did you set it's VISIBLE property to NO? Without seeing the database it's hard to tell. Spencer Black on 8/4/2013: I've installed Adobe Photoshop on my computer, and I'm getting a Photoshop .bmp logo, even after turning the images to bitmaps. Then I right-clicked on the image on my desktop to pick "open with" and changed my default file type for .bmps from Photoshop to Paint. Now I get a paint logo showing the .bmp file. That sounds about right. I like to use Paint for BMPs too. Sounds like you're trying to sort on an OLE field, which you can't do. I don't know why you're getting this message when you're trying to insert a subform. Some versions of Access can't have OLE objects in subforms. Try removing the field and see if the error goes away. Mai Nguyen on 8/17/2013: The insert button is not even active. I couldn't drop any type of picture in the picture box either. Without seeing your database, I can't tell you what's wrong. Raul Pendas on 9/7/2013: Rick, I click on a button and my all objectives are gone. I do not see tables, form and querry etc. How I get back to see on my left side the tables, form and querry? Raul, I'm not sure what you mean by "objectives." If you're missing the Navigation Pane on the left, you may have collapsed it (in which case it will show up as a bar that you can just click on) or hidden in (in which case, you need to check your startup options under File > Options). Lee L on 12/9/2013: I am having the same problem as others in the past. I have created a small24 bitmap photo and cannot get it to display in the picture area. Was this problem ever resolved for any of the other questioners? Geni Gellhaus on 12/17/2013: my pictures have a yellow triangle which usually means an error has occurred. I have pulled the photo from my desktop as I followed along on the (jpg & bmp)tutorial...created the whole nine yards following along and still the triangle appears in the box instead of a photo. I can dbl click on photo and it opens up in photo gallery...then I close photo and close db and it will tell me file can't be saved because of error. Salam on 1/2/2014: Only if you show it in "Form View" then you can see the "insert button" active, I noticed that. David Preston on 1/2/2014: Addendum to my previous question. If I create a company logo (bmp) - I am able to place the image on the name badge. However, I still cannot get a bmp to display on the picture field (dragging or choosing a bmp file). However, if I say, create a new bmp file; then MS word opens; if I have paste from any other image file (jpg or bmp) into my NEW bmp file, then it works!! David Sprecher on 4/21/2014: Great courses, thank you. I am on Access 2013. In design view I have the grid as squares with lines but no dots between. I have searched in vain for a fix in Options. Thank you. David Sprecher on 4/21/2014: I have had same problem as everyone else BUT I have resolved it (Access 2013). If you create the picture frame by using the "image" tool on the Design tab (just to the left of the "Insert Image" tool and to the right of the bound object frame)then the picture displays fine. In fact in that case you can insert a jpg and save on a LOT of space and some time. David Sprecher on 4/21/2014: Cancel my last post. That only works in design view to insert a picture and that self same picture is then on each record. Needs more thought. Sorry. David Sprecher on 4/21/2014: Sorry for this excessive posting but I have now found a work around (altho there must be an easier way). Right click on empty container, chose insert object, chose "Bitmap Image" option BUT chose option "Create New". That will take you to a blank sheet in Paint. Using the "Paste" tool, chose "Paste From" and then navigate to the file you want to use (jpg's are fine). It will then load into Paint and the record at the same time. Ignore the screen dots they will clear when you click away. This is all essential for me as I need to create a database of many actors, images are essential and bitmaps are rather large files for this purpose. Hope you're not sick of these posts! BJ on 4/27/2014: I am having trouble with inserting an image into the picture frame in the access form. I am using access 2013. I followed your tutorial (Access 2010 Beginner 6) to the letter, but when I try to drag and drop the image into the picture frame, I get the message "A problem occurred while Microsoft Office Access was communicationg with the OLE server or ActiveX control". Then it gives me instructions that I do not understand ("Close the OLE server and restart it outside of Access" -- how do I do this). Also, there seems to be no insert capability with 2013 -- is this true? If I right click the picture frame, a drop down box opens that gives a lot of formatting commands for the picture frame box, but there is no insert function. Can you help me with this? I have tried to insert bmp images, jpg images, and png images. I would greatly appreciate any adivce you can give me. Thank you. I just tried it with Access 2013, and it worked perfectly fine for me the first time. It may be an issue on your system. First, try rebooting. If that doesn't help, UNINSTALL and reinstall Office. The OLE on your system may be corrupted. BJ on 4/28/2014: Rick -- I emailed you earlier about a problem I was having in placing images into Access Forms. By accident, I discovered how to insert an image into my MS Access 2013 forms without having to deal with the warning I received earlier "A problem occurred while Microsoft Office Access was communicating with the OLE server or ActiveX control". In the deign tab of the 2013 ribbon, there are a number of buttons, one of which is "image". If one clicks on this button and drags the cursor to the form (in design view), the cursor changes to a little plus sign. By dragging the cursor, a box is drawn and a window opens for one to select the desired image. Once selected and an "OK" button is pressed, the image appears in the box. I still don't understand why the original method doesn't work and what the error message means, but at least I can now place images into the database form. Good. I'm glad you figured it out. David S on 4/30/2014: I don't think that works. I think you have put in an unbound image i.e. the image is part of the form design and does not change with each record. In Access Beginner 7 No1 @ 10.18. When I add a second report it is adding the new report underneath and not next to the new one. How do I correct that? I'm not exactly sure - can't tell from your description. Make sure you're dropping it in the right place. I wouldn't worry too much about this, however, because I almost NEVER use Navigation Forms, and in the next lesson you'll be learning a BETTER way to make menus. shawn mccune on 7/10/2014: I like knowing how to copy and paste labels between tables. This saves time and reduces work. Tareq Salloum on 10/1/2014: When you copy existing fields from one form to another one, does Access know automatically to change the source table where it gets the field information from? The CONTROL SOURCE of the TextBox or Control that you copy will copy over but the Form's RECORD SOURCE won't change, you will have to set that manually yourself. If you have already set the RECORD SOURCE of that Form and it contains a FIELD that matches the FIELD of the Control you have copied it will show that value. FARAAZ SIDDIQUI on 10/8/2014: Hi...When I am trying to right click the OLE Object Box. The Insert tab is de-activated in the drop down bar. I cannot click on it... Following happened to me in the form view (while following the previous video lesson 4) as well. I ended up cutting and pasting image straight from paint in my form view. Now in my labels...following image is not showing as well. What image editing software do you have on your machine? This can sometimes make a difference. CHARALAMPOS D on 11/8/2014: I have photoshop and Lightroom but for the purpose of the access learning I have chosen "paint" as my default program but no result. CHARALAMPOS on 11/8/2014: I have tried jpg and bmp but to no avail. Can I upload to you my small database and 2 or 3 photos in bmp format so you can see what is the problem? Access itself doesn't handle displaying images. It uses whatever your default Windows image handling program is to display them. If images aren't displaying properly in Access, chances are you have some other 3rd-party program set up as your default image handler that doesn't get along with Access. The easiest fix is to make sure that you have Microsoft Paint set up as the default handler for BMP, GIF, and JPG images. This is a Windows setting. You want to make Paint the application that opens images by default. You can do this by right-clicking on any BMP, GIF, or JPG file, selecting OPEN WITH, and then selecting Paint. Make sure to set this as the DEFAULT app (open with this app every time). The steps are roughly the same, but slightly different with each version of Windows. You may have some other application installed that's trying to "handle" your image files which is causing problems in Access. If you want us to look at your database for you, feel free to submit it to the TECHHELP team. However, be warned that 90% of the time it's a separate problem on your PC, not your database. Farrel Lazarus on 12/5/2014: Im working with Access 2013 ... I have notice that when using notes there is no Memo ... What should I do. Farrel they've changed the names of some Data Types in 2013. You now have "Short Text" and "Long Text" instead of "Text" and "Memo"
wendi keith on 12/24/2014: In Access, how do you make a birthday list. In order by month and year. Everything I try orders by the year first. Where is the Toolbox (start 07450) in Access 2013 (MS Office 2013). I don't see it. Please help! Vannak H on 1/1/2015: Richard, I just found it. Office 2013 is a bit different. It's in the Design, Controls, I just had to click on the down arrow key to see more of it. Took me a while to find it. Thanks again. Steve Reed on 1/21/2015: In Beginner level 6, putting together an Employee Table, how do you switch from Tab View to Window View? Choose one, click ok, you will be asked to close and re-open the db for it to take effect. Save your db and do so. I think that's the video that is zoomed not the Form. I don't think there is an option like you can in Word/Excel. 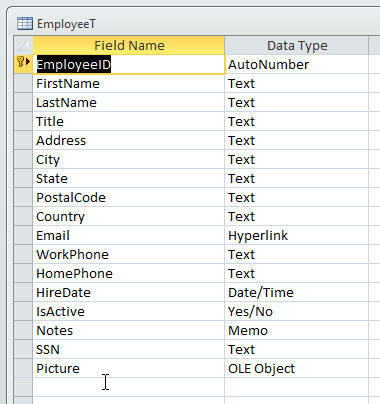 Robert Field on 1/31/2015: Can you copy and paste fields from Access Database to another Access Database like you did from one table to another table in this lesson? Christy Osterkamp on 2/20/2015: If I am not jumping ahead, can you tell me why I just added more lines to the table, but they do not appear on the corresponding Form? I thought we could add data to either/or. Is it bound to a Table or Query? If it's a Query is it limited by a Criteria? Christy Osterkamp on 2/20/2015: Figured it out for myself, sorry. The Number of records is not necessarily the next autonumbered record. 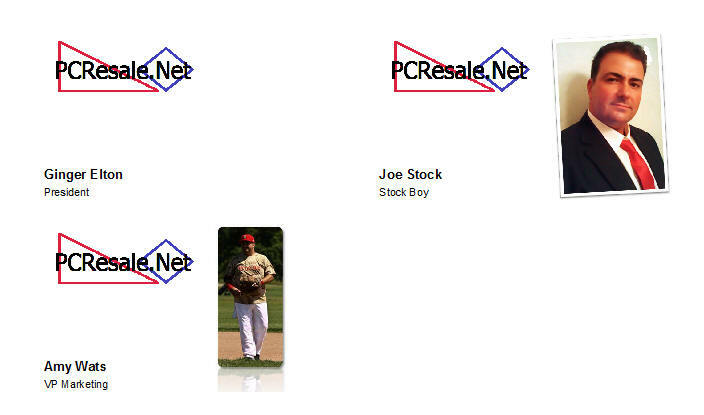 Steven Mcgavin on 7/20/2015: Working with your PCResale database I am having trouble inserting the .bmp picture. I am using Windows 8.1 and Office 365, the anual subscription office. The pictures show up as an icon and file name. When I double click on the icon it opens up in MSPaint and the picture is displayed. I've tried the suggestions but it still won't display in the form. I don't know what to try next. Do I need to worry about or just continue with your lessons? I don't have a 8.1 box at hand to test, can anyone help out? There's no reason why you can't continue. The Imagaing Seminar goes into a lot more detail which could be of use. There's a link to the Student Databases in the footer. Or you can use the search in the header. Justin R on 9/14/2015: Using Windows 10 and not a fan. Can't find paint so I took a screen capture and cropped it in excel. Then dragging that image in the OLE field and that works well. Have you tried just pressing the windows key and typing paint, it searches right there and then. Joe Beniacar on 9/17/2015: Hi Richard, what is the benefit of copying + pasting controls with the same names from 1 Form to another? It means you don't need to add names, formatting etc. Omar A on 10/8/2015: I've been having the same problem as everyone else in that .bmps are not showing on forms. I've followed every step given (including the pathname in the field), and the only solution was David's. That is, creating an OLE object field-->right clicking-->insert object-->create new-->bitmap-->paste your image in paint-->exit paint. That works fine, and I realized that in the field it then says "bitmap image". However, if we do it the way you demonstrated, it says "package". I feel whatever is causing that is the culprit. Any ideas? Do other types work for you? Omar A on 10/10/2015: They do not. However, since using the path file name and then referencing that with an image box does not bloat the database, I will be doing that from now on. Thank you. It's the preferred method, I'll take another look into why it might be happening. Meenakshi Sundaram on 12/18/2015: How can I change the Dollar Sign in the Currency field according to their respective currency sign. James Comninellis on 1/15/2016: Perhaps this is covered elsewhere, but how do you create an envelope report that has the right spacing btwn fields. For example, I want to send a letter to someone in St. Louis but also some in Marylandville Heights. How do I make a city field that will accommodate a long and short city name without awkward spaces? My question is regarding the way Access displays the information. I would like to be able to make Access let me have multiple forms, tables or queries open so I can work with them at the same time. (As you did in Lesson 3 Level6 Beginner at Time Index: 02:15, when you used two Forms at the same time). However, my Access only let me have one Form open covering all the screen. I already tried with Access Option|Current Database| Document Windows Options-Overlapping windows. But it doesn't seem to work. Could you help me out to change the way Access Displays the information? When you try and open two forms is it still opening as a tab? Marianne Bennett on 4/6/2016: I went back through the lessons and cannot find where you taught how to build a mailing label report. Could you guide me to that particular lesson? Did you try the search or the Outlines? There are a couple, check out the list. modi waggeh on 5/12/2016: Hi Richard, will the picture be remain in access, if I delete the original image on my local computer? And how to use file path to OLE object? I would advise against storing the picture in the db. William B on 3/17/2018: On lesson Beginner 6 Mr Rost explains how to put pictures into a employee file. this is the response i get from my computer. When attempting to do so. There isn't enough memory to complete the Automation object operation on the Bitmap Image object. Close unneeded programs and try the operation agian. For more information on freeing memory, search the Microsoft Windows Help index for memory, troubleshooting. Backup of db and then a compact and repair? William B on 3/20/2018: I got to looking into the property sheet and in the Employee Form for the Picture frame,needed to be set in the Data Section under control Source for Picture. Not sure if i missed it in lesson, But it working for now.